Rate this Article Virtual Reality though gaining popularity at a much slower pace than expected continues to evolve. The potential the technology has for future applications are huge, the reason why continued investments and development in the field prevails. New trends in VR gaming are continually being brought to market contributing to the overall direction and growth of the Games Industry. These are usually new products in VR hardware with newly added features which include the Headsets, Haptic Feedback systems, cameras, motion sensors and other VR control systems. Aside from this, new distribution platforms for VR content are emerging as well as new releases of the games themselves. The application of online server based VR gaming, personalized VR game content and the new release of several educational VR titles pretty sums up the list. These however are the surface trends, the actual products or end results of the core trends that are actually driving the growth of VR in the gaming industry. There are underlying reasons why new VR products come out as such. To understand why so, let's dig deeper. High-end Virtual Reality requires leading edge hardware, rapid evolution and the twin-scope nature of the PC. This includes the separation between the hardware (CPU, GPU, Headsets, etc.) and the software with its distribution platforms. All these components can evolve separately without taxing the overall PC/computer gaming system. The key to VR is photo-realistic graphics and our brains expect reality. This requires VR to deliver a sense of high realism and this becomes very disconcerting when the delivery falls short. A huge amount of graphical detail has to be presented correctly otherwise our brains will have difficulty in accepting the images. The current limitation in achieving such realistic video images in simple terms is that the resolutions needed to generate these are beyond the graphics hardware we currently have available right now. These currently still cannot display the amount of pixels needed for a VR standard and has to be worked on and developed. The drive of developers is to build content in and for VR in a fully immersive environment. Instead of using current third party applications to create and modify the 3D objects and manipulate them , the process can be done using specialized VR editors which would facilitate an easier way to develop games within VR itself. Usual applications like PhotoShop. 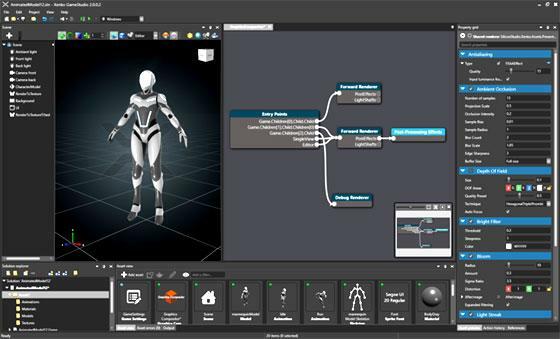 3D Studio Max, MAYA and the like will have to be re-developed for use in VR. design and creation of their game environments within VR. A rather practical alternative to creating them on a computer monitor and then transferring to VR as they do today. Game Engines like Unreal and Unity along with their editors are being re-developed and pushed fot VR as they cam be used not only to develop games but serious productive applications in other fields as well like Architecture, Commerce and Marketing. This gives potential clients the option to view products and designs in real time VR. They will be able to pull it up, rotate it and even see what happens when they customize or modify it. Another important trend in the VR game industry is the creation of very realistic VR characters. Creating a realistic person in VR will require a lot of complex steps which will include the effects of light on color and surface properties, skin tones, smoothness of movement, and other factors like realistic clothing and how they are rendered in the actual VR scenes. Creating realistic eyes are important as well to be able to achieve realistic interactions between the player and the characters as these will include facial animation, body language, and the complexity of the AI control for the NPC characters. Again, all of these require very high resolution to achieve the best results. Multi-player gaming is another major current issue in today's VR trends. Almost if not fully realistic social interaction will be soon available if current development trends on multi-player gaming inside VR continues. The drive is to be able to capture the user's facial and body movements and project them into the VR world making the communication between players through their avatars as real as possible. These can be accomplished with current input devices like cameras and motion sensors tweaked for VR use. Imagine the motion capture technology used in high-end quality games like Lara Croft and Uncharted miniaturized for use in VR applications and projected into VR in real time. Finally, the miniaturization of VR equipment will be a major upcoming trend. In today's world where the ease of use or user friendly mentality has been applied to almost everything and anything, the convenience of something much smaller than current HMD's that can be linked wirelessly or remotely to a powerful computing device or PC will provide the convenience and flexibility for a much more realistic VR experience than what we currently have. VR places the player in a completely immersive environment with around 120Deg field of view and attempts to create a realistic presence. It will push computing technology as far as it can currently go in order to achieve the results and quality required by today's gaming industry. With these current trends pushing VR, it will be just a matter of time when VR games will make it practically impossible to distinguish Virtual from Reality.